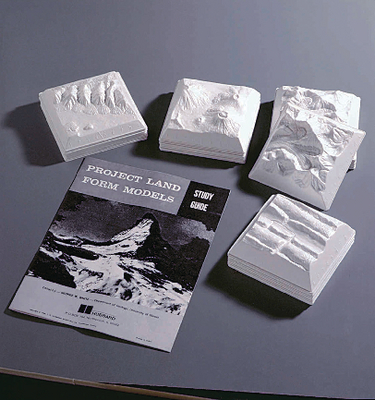 Better than just a simple demonstration; your entire class can work on the ten sets of four land types: fault mountains, folded mountains, mountain glaciation, and volcanoes, to gain a greater understanding of each landform. Students can mark characteristics and color a variety of natural features on the styrene forms, such as arid regions, contours, rivers and streams, rock types, subsurface cross sections, and vegetation, as well as man made features such as airports, cities, cultivated fields, farms, mines, railroads, ranches, recreational areas, and roads. You will also receive a study guide. Size: 5".